Oy Vey! Isn’t a Strategy. But it’s a Darn Good Read. Posted on July 25, 2012 by Author Lisa Colton Leave a comment on Oy Vey! Isn’t a Strategy. But it’s a Darn Good Read. I have three stacks of books by my bed: the professional reading, the personal reading (parenting books, etc.) and the ‘for fun’ reading (novels, biographies, etc). The urgency usually follows that order, to the point that my last new years’ resolution was to read more fun novels. It’s July. The end of July. I have read exactly 1. 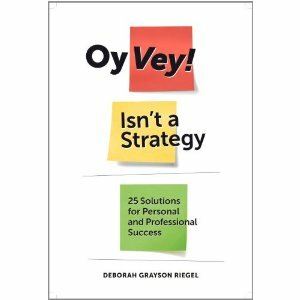 So it’s a good thing I picked up Deborah’s book, Oy Vey Isn’t a Strategy. The book was officially in the first pile: professional reading. Though it very well could have been in the second (striving for better work/life balance, personal satisfaction, etc.). About 2 pages in I realized it was entertaining enough to qualify for the “just for fun” pile too. This woman is a hoot! This book really transcends any category, or perhaps better put, it delivers value in all of them. Deborah puts so much of herself into this book. In some places it reads like a memoir, and knowing Deborah, I have fully enjoyed getting to know her better through her amazing personal, familial and professional stories. We can all see a bit of ourselves in her journeys and reflections. But the real punch of the book is that Deborah uses her own entertaining stories (and delightfully funny writing style) to hold up a mirror for us to see, and understand, ourselves – personally, professionally, emotionally, strategically. I cracked the book on an airplane that was already running hours late on a flight home from Chicago. We were taking off at 10pm. I’d arrive home in the wee hours of the morning. I intended to peruse the first chapters and then sleep, but I could not but this book down. By the time I got to chapter 8 (which begins, “Temporarily losing my left eyebrow changed me permanently…”) I had given up sleep and found myself giggling out loud (apologies to the gentleman reading a neuroscience journal in 9B next to me). But within a few pages in every chapter, Deborah seamlessly moves from the upturn of my smile to the depth of my heart and gut, gently and firmly holding and articulating the issues that are at the root of our happiness and success. And just to make sure that the ideas and reflections don’t end in our heads, each chapter ends with questions and exercises to help us really knead our own experiences and apply her teachings to our own lives. The most insightful nuggets of this book sometimes are delivered in insightful one liners. It’s full of them. My favorite? 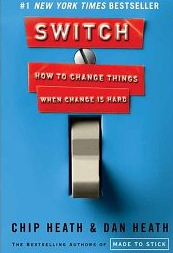 In chapter 14 Deborah observes that for many of her clients seeking help as ‘self diagnosed procrastinators’, “we discover that procrastination is masking perfectionism”. BULLSEYE. While I don’t find that I’m a serial procrastinator, this is exactly why it does occasionally happen. And that procrastination can be costly – in time, energy, dollars, relationships, and attention wasted elsewhere. Small lessons can have big impact. And this book is full of them. My ‘personal reading’ stack includes many Jewish books. While I work with rabbis and Jewish educators everyday, I’m always wishing I could make more time for my own Jewish learning. And, as if Oy Vey hadn’t delivered enough yet, the Jewish lessons, quotes and stories are woven throughout. Deborah’s lessons for us are grounded in experience, training, wisdom, thoughtfulness, and tradition. And when I was done, exhausted and travel weary, I felt grounded too. A Skinny Book. Buy 12 Copies. Posted on March 27, 2012 by Author Lisa Colton Leave a comment on A Skinny Book. Buy 12 Copies. from assuming a fee-for-service economy towards expecting a free-for-service economy (at least at a basic level). What does this mean for synagogues? A lot. While change is hard, it is necessary. We cannot keep our heads in the sand. We are living in a moment where the risk of staying the same is greater than the risk of change. Plain and simple. If we accept the change is necessary, then the question is what do we want, and how do we get there. Tomorrow’s Synagogue Today is a great step on that journey. How are thinking about the changing context of synagogue life, and its implications for your congregation? If you’ve read the book, what stood out for you, and how are taking action? 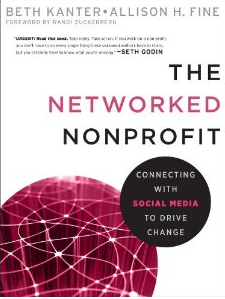 And if you do read this book as a group, please share with us about your process and the discussions it provokes. For some, social media is a bit scary because it empowers the public to voice their thoughts. While hopefully in the vast majority of circumstances this means engaging in more meaningful conversations, learning about new supports, and amplifying your message through valuable networks, it also means that critics can make their rants public. This is scary, and threatening. Partially because of the potential content of those rants, and largely because it represents a loss of control. If you are fortunate enough to have critics, you’re doing something right … I want to share with you how I deal with critics, and what you might learn from the gifts they give you. Thank them. No matter what a critic says, say “Thanks for your thoughts,” or a variation. They have taken the time to offer their opinions, however invalid or unhelpful, with you. Say thanks. It’s the only good response to a criticism. Don’t defend yourself. The person giving you the opinion probably doesn’t care what you have to say about it. They just wanted to share their take. You can reply and reflect back what they’ve said, but try not to defend. It only comes off as making you look defensive and it just goes nowhere fast. Decide for yourself, in private, if you agree. You don’t have to take every critic’s opinion, but listen to whether there’s any grain of truth in what they say. I learn when my critics are my friends, but I learn LOTS when they are people who don’t much like me. Sometimes, I’m able to adapt their mean words into something of great value to myself. Don’t just throw it out, is my point. Criticism can be helpful, even non-constructive criticism, if you are willing to hear a bit of it and throw away the junk. Thing is, don’t necessarily run around seeking it, either. It can build up like toxin in our veins, and if we’re only hearing a stream of icky things, that doesn’t help us at all. … It took me a long while to believe in myself enough to not believe in critics. There’s a great bit from an interview (and I forget who the subject was), where she said something about really loving her positive reviews, but then her agent said, if you believe all the positive reviews, you have to believe all the negative critics. That’s stuck with me. Personally, I’ve found most of the criticism we receive on the JewPoint0.org blog is really helpful — it teaches me where I can improve, adds value to the conversation, and often helps me identify knowledgeable folks who are invested in our mission. How do you think about critics and criticism, whether it be on or offline? How do you use it as a productive feedback loop? How to you respond to critics? What have you learned?